The Clinical Quality Language Specification  defines a representation for the expression of clinical knowledge that can be used within both the Clinical Decision Support (CDS) and Clinical Quality Measurement (CQM) domains. Although several standards exist for the expression of clinical quality logic, these standards are not widely adopted and present various barriers to point-to-point sharing of clinical knowledge artifacts such as lack of tooling, complexity of implementation, or insufficient expressivity. Rather than attempt to address these shortcomings in one of the existing standards, this specification provides a solution to enable shared understanding of clinical knowledge by defining a syntax-independent, canonical representation of logic that can be used to express the knowledge in any given artifact, and point-to-point sharing by defining a serialization for that representation. The canonical representation, the Expression Logical Model (ELM), is informed conceptually by the requirements of the clinical quality domains of measurement and improvement, and technically by compiler design best practices. The resulting canonical representation provides a basis for sharing logic in a way that is at once verifiable, computable, and can serve as the input to language processing applications such as translation, tooling, or even execution engines. In addition, this specification introduces a high-level, domain-specific language, Clinical Quality Language (CQL), focused on clinical quality and targeted at measure and decision support artifact authors. This high-level syntax can then be rendered in the canonical representation provided by ELM. Metadata – Information about the artifact such as its identifier and version, what health topics it covers, supporting evidence, related artifacts, etc. 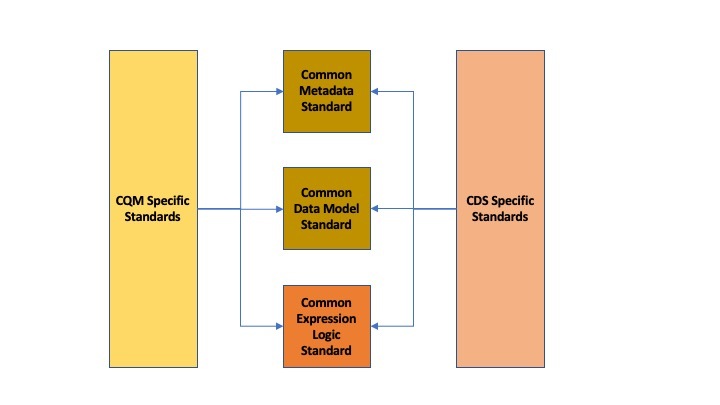 Following this overall structure, this specification focuses on the common representation of expression logic that CQM and CDS-specific artifact standards can then reference. Separate specifications address metadata and data model. Note, however, that the QUICK specification, and the Quality Improvement Core (QICore) Profiles are being developed concurrently with this specification to ensure that the two specifications interoperate effectively. There is work underway to provide QDM to QICore profile mapping for the use of FHIR-based data models for quality improvement use cases. The skeletal maps are available in the QICore Implementation Guide. In addition, this specification is designed to be data model independent, meaning that CQL and ELM have no explicit dependencies on any aspect of any particular data model. Rather, the specification allows for any data model to be used, so long as a suitable description of that data model is supplied. Chapter 7 of this specification discusses how that description is supplied, and what facilities an implementation must support in order to enable complete data model independence of CQL and ELM. The S&I Framework uses a set of integrated functions, processes, and tools that enable execution of specific value-creating initiatives. Each S&I initiative focuses on a single, narrowly scoped, broadly applicable challenge. As discussed in Section 1.1, one key principle underlying the current harmonization efforts is the separation of responsibilities within an artifact into metadata, clinical information, and expression logic. Focusing on the expression logic component and identifying the requirements common to both quality measurement and decision support, the Clinical Decision Support HL7 Work Group produced a harmonized conceptual requirements document: HL7 Domain Analysis Model: Harmonization of Health Quality Artifact Reasoning and Expression Logic. These requirements form the basis for the reasoning capabilities that this specification provides. Building on those conceptual requirements, this specification defines the logical and physical layers necessary to achieve the goal of a unified specification for expression logic for use by both the clinical quality and decision support domains. Author – The author perspective is concerned with clearly and correctly communicating and interpreting the semantics defined at the conceptual level, from a human perspective. Logical – The logical perspective is concerned with representing the semantics of expressions in the simplest complete way. Physical – The physical perspective is concerned with clearly and correctly communicating or interpreting the semantics defined at the logical level, from a machine perspective. In other words, the logical level of the specification can be thought of as a complete bi-directional mapping between the author and physical levels. The various components involved in the specification are then concerned with ensuring that semantics can be clearly communicated through each of these levels. At the highest level, the author perspective is concerned with the human-readable description of clinical quality logic. This level is represented within this specification as a high-level syntax called Clinical Quality Language (CQL). CQL is a domain-specific language for clinical quality and is intended to be usable by clinical domain experts to both author and read clinical knowledge. The author perspective is informed conceptually by the Quality Data Model (QDM), the current conceptual representation of electronic clinical quality measures, and so the language being used is informed by the QDM-based logic. This heritage is intended to provide familiarity and continuity for authors coming from the quality space. The logical perspective of the specification is concerned with complete and accurate representation of the semantics involved in the expression of quality logic, independent of the syntax in which that logic is rendered. 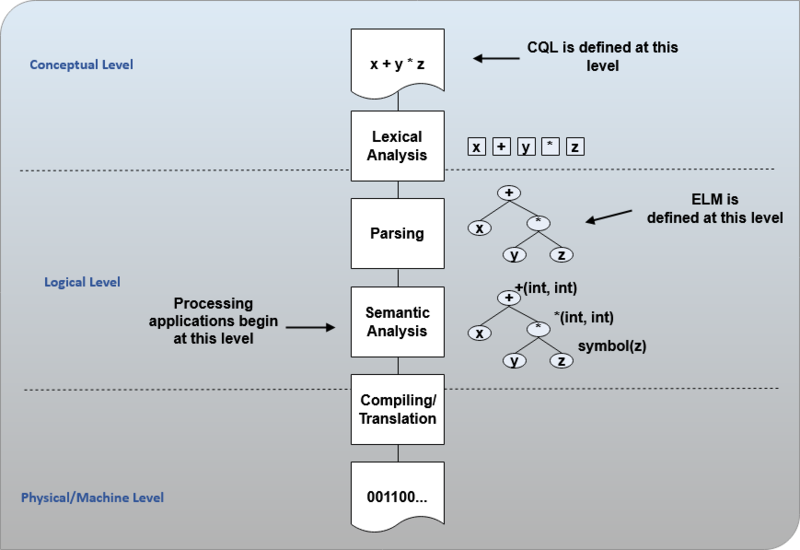 As shown here, the ELM representation is defined as an Abstract Syntax Tree, eliminating the need for lexical analysis and parsing steps, and allowing implementations to concentrate on the core representation of the logic. In addition, this approach avoids potential ambiguity that must be resolved with operator precedence and/or the use of parentheses in traditional expression languages. The result is a dramatic reduction in the complexity of processing quality artifacts, whether that processing involves translation to another format, evaluation of the logic, or building a user-interface for authoring or visual representation of the artifact. The logical perspective is informed conceptually by the HL7 Version 3 Standard: Clinical Decision Support Knowledge Artifact Specification, Release 1.2 (CDS KAS), a prior version of a standard for the representation of clinical decision support artifacts. This heritage is intended to provide familiarity and continuity for authors and consumers in the decision support space. The current version of that standard, Release 1.3, has been updated to use the ELM as defined in this specification. The physical perspective is concerned with the implementation and communication aspects of the logical model—specifically, with how the canonical representation of expression logic is shared between producers and consumers. 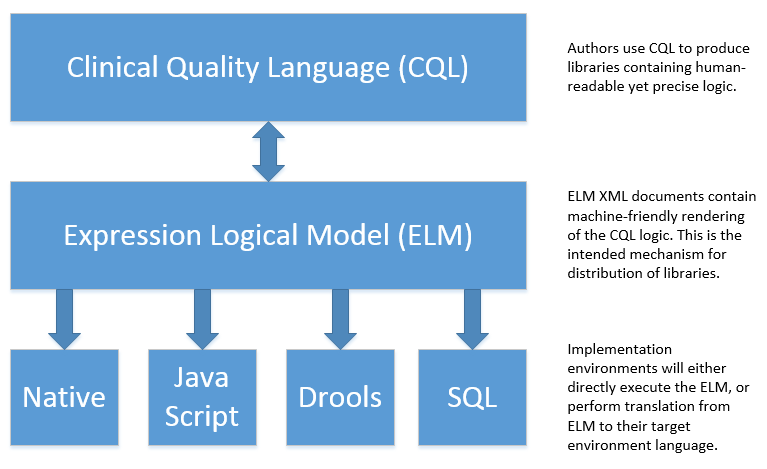 This specification defines an XML schema representation of the ELM for this purpose, describes the intended semantics of CQL, and discusses various implementation approaches. The audience for this specification includes stakeholders and interested parties from a broad range of health quality applications, including health IT vendors, quality agencies, quality artifact authors and consumers, and any party interested in producing or consuming health quality artifacts. A systems analyst, architect, or developer interested in building language processing applications for artifacts based on the Clinical Quality Language specification, such as translators, interpreters, tooling, etc. Note that even the material in Chapter 2 is somewhat technical in nature, and that Authors will benefit from some familiarity with and/or training in basic computer language and database language topics. In general, each of these roles will benefit from focusing on different aspects of the specification. In particular, the Author role will be primarily interested in Chapter 2, the Language Guide for the high-level CQL syntax; the Developer role will be primarily interested in Chapters 2 & 3; the Integrator role will be primarily interested in Chapter 4, the formal description of the logical model; and the Implementer role will be primarily interested in Chapters 5, 6, and 7, which discuss the intended execution semantics, translation semantics, and physical representation, respectively, as well as Chapter 9 - Appendix B, and ELM UML model artifacts. Note that syntax highlighting is used throughout the specification to make the examples easier to read. However, the highlighting is for example use only and is not a normative aspect of the specification. It is important for implementers to clearly understand the underlying environmental assumptions, defined in Section 5 of the CQF Use Case document referenced in the previous section, to ensure that these assumptions align to the implementation environment in which content will be exchanged using a knowledge artifact. Failure to meet any of these assumptions could impact implementation of the knowledge artifact. The Clinical Quality Language specification is designed as a general purpose query language suitable for describing clinical knowledge in a broad range of applications. As such, it has relationships to, and can be used by, several other HL7 specifications, as explained in the sections that follow. Health Quality Measure Format is an HL7 V3 Standard for the representation of electronic Clinical Quality Measures (eCQMs). HQMF uses a conceptual model of clinical information called Quality Data Model (QDM) to represent patient information in population criteria for the measure. QDM originally (and through version 4.3) also included an expression language for use in eCQMs. Clinical Quality Language is capable of providing more precise and flexible semantics and HQMF-based eCQMs have transitioned to using Clinical Quality Language. The Knowledge Artifact Specification is an HL7 Standard for the representation of clinical decision support artifacts such as order sets, documentation templates, and event-condition-action rules. The original version (and through release 1.2) of that specification included an XML-based syntax for encoding the logic involved in the knowledge artifacts. The Expression Logical Model defined by this specification is a derivative of that XML-based syntax, and in release 1.3 of KAS, the syntax was updated to reference this specification. FHIR is an HL7 standard for enabling healthcare interoperability by defining a framework for reliable data exchange. The Clinical Reasoning Module of FHIR describes how Clinical Quality Language can be used within FHIR to represent the logic involved in knowledge artifacts. FHIRPath is an HL7 specification for a path-based navigation and extraction language, somewhat like XPath. CQL is a superset of FHIRPath, meaning that any valid FHIRPath expression is also a valid CQL expression. This allows CQL to easily express path navigation in hierarchical data models. For more information, see the Using FHIRPath topic in the Developer’s Guide. 2. Note that ELM is unrelated to the similarly named elm programming language (see http://elm-lang.org).